I am lucky enough to live on an island that attracts artists – poets, novelists, painters, sculptors, glass blowers, potters, you name it. A big event here, especially in the summer, is an exhibit opening. Cars line the streets and crowd onto lawns, then hordes of people wander through the gallery, sipping wine and chatting with old friends. It’s a pretty nice way to spend a summer evening. This past Sunday, I went to the opening of the new exhibit of one of my favorite island painters, Kara Taylor. As I was looking at her output from this past winter, she came over to me to remind me of something special which she had just realized. This opening marked more than a decade of her having her own gallery. After we got over that shock, we began to reminisce some more and recalled when we met at her first gallery, which was just a couple of rooms behind a local farm stand. I had wandered in to buy some tomatoes, which she was also in charge of selling, and we started to talk. She told me she was a painter showing some of her work for the first time. I told her I was a writer, working on my first novel. She told me about how she incorporated the notes from a dear old friend, a physics professor, into her painting. I told her that the main character of my novel was a physics professor. 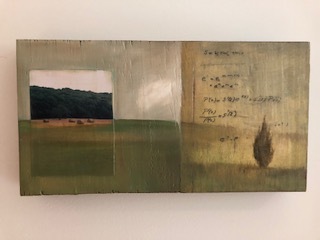 Then I looked at her work, and there it was: a landscape with physics calculations embedded into it. I bought it on the spot. The synchronicity was too overpowering to ignore. She sold many other paintings that summer, and has now progressed to her own space and a worldwide clientele. I eventually completed my novel, and sold it to a publisher, thus beginning my career as a novelist. That novel is called Tangled Roots, and that was 10 years ago! Over the past decade I have had two more novels published, and a fourth one is on the way. Kara’s work has taken many twists and turns, and has grown in richness and innovation. But with each new novel, I have bought another Kara Taylor work which I have gazed at while writing, which has served as inspiration. Although my novels have moved away from science in America and Russia, to social activism in Cambodia, I have always found something new of hers to to be the talisman, leading my imagination on to pages between book covers. Her work has added color to my own. I look forward to seeing where our creativity leads us to next. But for now, I’m happy to look back over ten years of haphazard collaboration and know that art feeds all artists, no matter what the form or the seeming irrelevance. That is a weird coincidence. I think that you’re both lucky to have stumbled across it. Writing has given me several contacts, started due to a shared commonality (in some cases struggle and annoyance) but often developing to support and friendship. To find that with other art forms where you each have a similar, yet different perspective is great.